Conservatives rally on behalf of veterans and liberty in a way that does nothing to advance the cause of either. A crowd of conservative protestors stormed the black metal barricades at the Washington, D.C., World War II Memorial Sunday, objecting to the closure of monuments that the Obama Administration ordered in response to the federal shutdown. "Let me ask a simple question," Senator Ted Cruz said to hundreds of apparent Republicans as the day of rallying began. "Why is the federal government spending money to erect barricades to keep veterans out of this memorial?" Trust me when I say that I find the barricades as absurd as any right-wing populist, and that on the subject of Washington memorials I am a more radical libertarian than any elected Republican. I'd love nothing more than to sit sipping beer on the steps of the Lincoln Memorial, as I've done on the steps of so many European churches, and when my libertarian friends were arrested for holding a silent dance party to celebrate the birthday of Thomas Jefferson at the memorial dedicated to him, I regarded that as an absurd display of federal idiocy too. I've spent my life ignoring signs informing me that beaches and parks close at 10 p.m., even when there are no surrounding houses that noise would affect, and I'm glad there are citizens out there ignoring the inane barricades. But part of me can't help but read about the rally at the World War II Memorial and think, "To hell with you, conservative activists. This perfectly illustrates your uselessness." I don't just mean that, but for the useless government shutdown that Tea Party Republicans provoked, the World War II Memorial would be open. 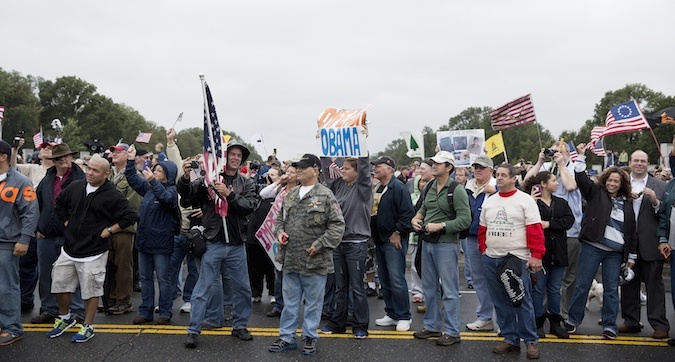 What actually bothers me most about this little rally is what it says about the priorities of Tea Party leaders like Cruz and Sarah Palin, and the rank-and-file conservative activists who trudged out to the World War II Memorial to protest its closure. They speak the language of liberty in expressing outrage at the metal barricades, insisting that it's an insult to soldiers who risked their lives to beat the fascists. Meanwhile, the Veterans Affairs Department has furloughed almost 8,000 employees (half are veterans). Its backlog of disability applications has been increasing for the duration. "The Pentagon says it no longer has authority to pay death gratuities—which is typically a cash payment of $100,000—to the survivors of servicemembers killed in action," CBS reported last week. (Since then, Congress has passed and President Obama has signed a bill reinstating the benefit). And even when the federal government is functioning normally, it fails to adequately care for the veterans of Iraq and Afghanistan, who are suffering from high rates of suicide, PTSD, and joblessness, in large part due to the wars of choice they were asked to fight and that conservatives, who are still allied with a faction of haws urging even more wars of choice, overwhelmingly backed. On liberty, Tea Party leaders, including Cruz, have spoken out against domestic use of drones, and many Tea Partiers are better than Obama on the subject of surveillance, at least in their rhetoric. At the same time, protesting temporary barricades at the World War II Memorial in the name of liberty seems rather absurd at a time when every single American is having his or her phone records and web behavior monitored by surveillance agencies, laptops, and other electronic devices are being seized without even the need for reasonable suspicion at airports and other border crossings, whistleblowers are being persecuted for telling the American public the truth about surveillance, and the NSA invests more money to further increase its activities. A closed memorial is the thing that gets these folks most riled up? Seriously? What I think, when I see that memorial closures are the thing that gets conservatives in the streets, is that movement leaders and rank-and-file activists alike cannot be counted on to identify and take on the most serious issues facing veterans, or the most serious threats to liberty. Instead they spend their time seizing on symbolic issues that promise to result in the best optics for a given news cycle—World War II veterans traveled to Washington and can't visit the memorial dedicated to them! Think what victory would mean in this instance: The barricades would come down, which will happen anyway as soon as the government reopens. In other words, there's no substantive upside for this particular rally, whether you're concerned about benefitting veterans or safeguarding liberty. It was held so that Cruz and Palin could aggrandize themselves, so that conservatives could revel in their self-image as liberty loving patriots who honor veterans, and so that the Obama Administration would look bad. Protests are nothing more than political theater for these people. Or if they actually intend to effect change, their strategy verges on nonsensical. When the barricades are removed, whether because the Obama Administration is pressured due to the absurdity of it all or because the shutdown ends, conservatives will find a way to make Obama look bad in the next news cycle, and their political theater, whether successful or unsuccessful, won't lead to any actual victories. They won't marshall anything like the focus or grassroots passion that's needed to actually improve the care of veterans in America or the degree to which our liberties are secure, because bettering governance is not their goal. Publicity stunts optimized for generating outrage in a given news cycle are all they've got, and even those haven't been effective at winning converts.